It’s about predictability, repeat-ability… and not eating crap. Above is near enough six years of my life in kilograms. The red ovals highlight January from 2013 to 2018. Every January, I do the same thing to correct my weight back down to where I want it to be at the start of the year and that allows me to eat more or less exactly what I want during the rest of the year without worrying that my weight will be not under control. It’s clear that the variation stays more or less within the same top and bottom bounds from year to year and the weight loss in every January is pretty much the same. So how do I lose about 6kgs every January? It’s easy, just follow the Whole30 plan and eat real food. It really is as simple and as straight forward as that. I don’t really know what to say. It gets worse with each statistic. Our bodies are made for starvation and body fat is our insurance policy to ensure we survive. The human body doesn’t like change and when you try to change a bit of it, it employs systems to resist that change i.e. temperature goes up, we sweat to bring it down. It does the same thing with body fat. If we eat less the body has fewer calories to play with so it either does less (slows down movement for e.g.) or does something less intensively (turns down our body temperature slightly). Researchers have shown this by attaching movement sensors to people on a calorie restricted diet and have measured less movement, even though the dieters reported that they moved the same amount. The action of fast acting carbohydrates is shown in the right-hand graph below and slower acting foods on the left. You will note that fast acting carbs crash blood sugar below its normal fasting level. This will make your body want to rebuild that blood glucose to the level it should be quickly, and irrespective of what your overall nutritional status is, it will decide you need to eat and eat something that will replace the missing glucose quickly – i.e. more carbohydrates – and the cycle therefore begins again. That’s addiction in my book. As a pretty vulnerable animal, we are astonishingly successful. Partly because of our big (although smaller than they used to be) brains and partly because we can do without food for a long time when hunting is bad and food is scarce. When calories are in short supply, we tend to move less we are not so warm and we hang on to all the resources we can and the most important one of these is body fat. We therefore keep hold of it for as long as we can and use it only when we have to or, crucially, when can replace it easily – i.e. there is plenty of fat in our diet. The longest recorded human fast (no food at all) was 382 days without any ill effects. All of which makes it VERY HARD TO ACHIEVE SUBSTANTIAL AND SUSTAINED WEIGHT LOSS. 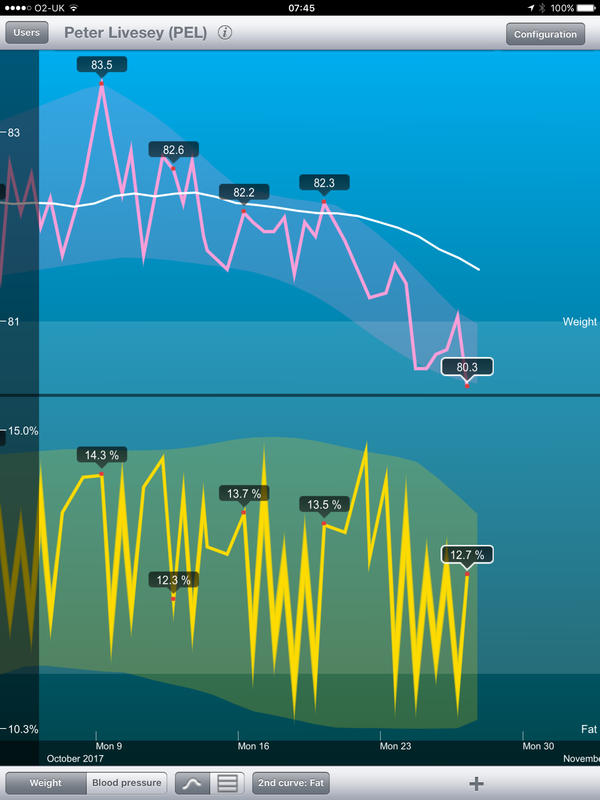 As you can see from the graph there have been setbacks, but Sally has achieved her dream of turning around her health. She did it all on a primal/paleo diet with no calorie restriction and just a bit of intermittent fasting in the last few months. Because of Sally’s honesty, we know that the times her weight increased were the times where, for various reasons, she fell off the primal wagon. But she always picked herself up and got back on again. There was another interesting issue that was associated with coming off and going back on a primal diet. When Sally came to me three years ago, one of the issues she had was arthritis in her hands, which isn’t good for a jewellery maker like her. While she was strictly primal however, the arthritis went away, when she wasn’t, it came back. It was a regular as clockwork – primal, no arthritis; not primal, arthritis. Sally is currently 100% primal and 100% arthritis and pain free. It’s not the first time I have seen this in my clients. Sally now wants to get her BMI a bit below 25 in time for Christmas before entering the maintenance phase and I think she will do it. What a Christmas present that would be! Well done Sally, I am very proud to have had the opportunity to work with you over the years to achieve your goal. To succeed, you only have to fall down seven times and get up eight.